The Pooh stories have been translated into many languages, including Alexander Lenard's Latin translation, Winnie ille Pu, which was first published in 1958, and, in 1960, became the only Latin book ever to have been featured on theNew York Times Best Seller List. Original Winnie-the-Pooh stuffed toys. Clockwise from bottom left: Tigger, Kanga, Edward Bear ("Winnie-the-Pooh"), Eeyore, and Piglet. Roo was lost long ago; the other characters were made up for the stories. Milne named the character Winnie-the-Pooh after a teddy bear owned by his son, Christopher Robin Milne, who was the basis for the character Christopher Robin. Christopher's toys also lent their names to most of the other characters, except forOwl, Rabbit, and Gopher (added in the Disney version). 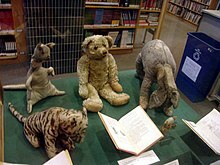 Christopher Robin's toy bear is now on display at the Main Branch of the New York Public Library in New York City. Christopher Milne had named his toy bear after Winnie, a Canadian black bear which he often saw at London Zoo, and "Pooh", a swan they had met while on holiday. 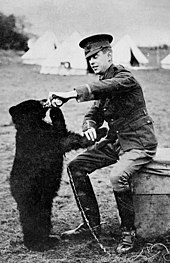 The bear cub was purchased from a hunter for $20 by Canadian Lieutenant Harry Colebourn in White River, Ontario, Canada, while en route to England during the First World War. He named the bear "Winnie" after his adopted hometown in Winnipeg, Manitoba. "Winnie" was surreptitiously brought to England with her owner, and gained unofficial recognition as The Fort Garry Horse regimental mascot. Colebourn left Winnie at the London Zoo while he and his unit were in France; after the war she was officially donated to the zoo, as she had become a much loved attraction there. Pooh the swan appears as a character in its own right in When We Were Very Young. But his arms were so stiff ... they stayed up straight in the air for more than a week, and whenever a fly came and settled on his nose he had to blow it off. And I think – but I am not sure – that that is why he is always called Pooh. The Winnie-the-Pooh stories are set in Ashdown Forest, Sussex, England. The forest is a large area of tranquil open heathland on the highest sandy ridges of the High Weald Area of Outstanding Natural Beautysituated 30 miles (50 km) south of London. In 1925 Milne, a Londoner, bought a country home a mile to the north of the forest at Cotchford Farm, near Hartfield. According to Christopher Milne, while his father continued to live in London "...the four of us—he, his wife, his son and his son's nanny—would pile into a large blue, chauffeur-driven Fiat and travel down every Saturday morning and back again every Monday afternoon. And we would spend a whole glorious month there in the spring and two months in the summer." From the front lawn the family had a view across a meadow to a line of alders that fringed the River Medway, beyond which the ground rose through more trees until finally "above them, in the faraway distance, crowning the view, was a bare hilltop. In the centre of this hilltop was a clump of pines." Most of his father's visits to the forest at this time were, he noted, family expeditions on foot "to make yet another attempt to count the pine trees on Gill's Lap or to search for the marsh gentian". Christopher added that, inspired by Ashdown Forest, his father had made it "the setting for two of his books, finishing the second little over three years after his arrival". Many locations in the stories can be linked to real places in and around the forest. As Christopher Milne wrote in his autobiography: “Pooh’s forest and Ashdown Forest are identical”. For example, the fictional "Hundred Acre Wood" was in reality Five Hundred Acre Wood; Galleon's Leap was inspired by the prominent hilltop of Gill's Lap, while a clump of trees just north of Gill's Lap became Christopher Robin's The Enchanted Place because no-one had ever been able to count whether there were sixty-three or sixty-four trees in the circle. The landscapes depicted in E.H. Shepard’s illustrations for the Winnie-the-Pooh books are directly inspired by the distinctive landscape of Ashdown Forest, with its high, open heathlands of heather, gorse, bracken and silver birch punctuated by hilltop clumps of pine trees. In many cases Shepard's illustrations can be matched to actual views, allowing for a degree of artistic licence. Shepard's sketches of pine trees and other forest scenes are held at the Victoria and Albert Museum in London. The game of Poohsticks was originally played by Christopher Milne on a footbridge across a tributary of the River Medway in Posingford Wood, close to Cotchford Farm. The wooden bridge is a tourist attraction, and It is traditional to play the game there using sticks gathered in nearby woodland. When the footbridge required replacement in recent times the engineer designed a new structure based closely on the drawings by E. H. Shepard of the bridge in the original books, as the bridge did not originally appear as the artist drew it.